"The tomato taste and seasonings are worth the time and effort. Try the sauce with okra, too. Enjoy!" 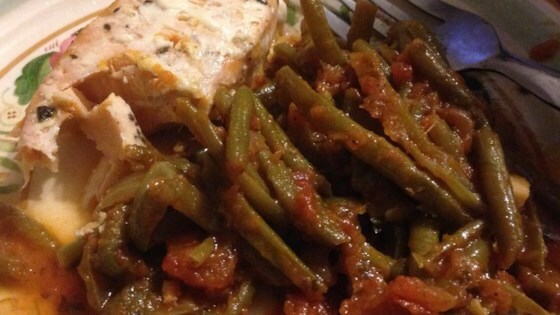 Place the green beans in a pot, and mix in the lemon juice, onion, olive oil, tomatoes, tomato sauce, parsley, water, salt and pepper, and bay leaf. Cook 45 minutes over medium heat, stirring occasionally, until sauce is thickened. Remove bay leaf before serving. This is a great recipe! I added a clove of garlic and a little cayenne pepper and used fresh parsley from the garden. This went great with our grilled chicken. Add some chopped garlic to taste.....I didn't use quite as much lemon juice, but it still came out quite good. Very nice...I added a pinch of sugar to the sauce and extra lemon juice after it was done. Served with rice, it hit the spot.